I'm always looking for educational ways to keep River (age 4) busy and engaged while the other kids are doing schoolwork. I love that River plays well independently and for part of the day I'm perfectly comfortable to let him do his own thing, but it's important for him to also be developing and growing his brain and continuing to work on his motor skills, so I'm always on the lookout for super low cost (ie - free) engaging activities for him.. 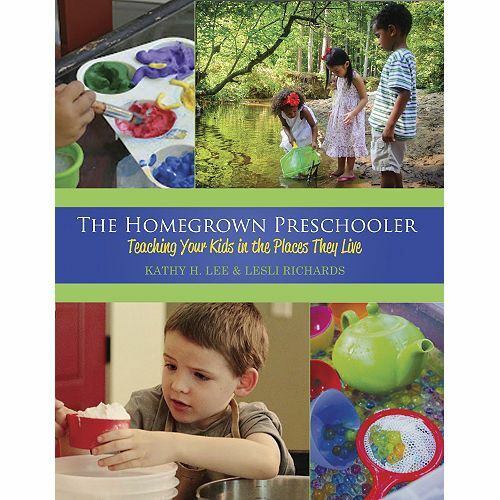 I was given the opportunity to review The Homegrown Preschooler, Teaching Your Kids in the Places They Live, by Kathy H. Lee and Lesli M. Richards, published by Gryphon House Books. I was happy to do the review and looked forward to receiving the book, and I have to say from the beginning that it exceeded my expectations. To start, the soft-cover 204 page book is beautiful. I realize that's not a reason to love a resource book but I don't care, it's pretty and that made me happy. A book about preschool and family activities with great pictures and an easy to follow, eye catching layout is so much more fun than a boring old textbook, and sure kept my attention. The first half of the book begins by introducing the idea of home schooling preschoolers and then moves into a "how to" of homeschooling for beginners. From there the book touches on special circumstances, like kiddos with special needs and adoption, as well as days that aren't normal - sick days, "off" days (we have them ALL the time). The book finishes with 80 pages of activities and really cool ideas. 80 pages does not mean 80 activities, a single page may have a few ideas on it, or ten or more - and the first sections of the book are also filled with activities and ideas. As a former daycare teacher I've got a memory file full of preschool projects yet on every page I found fun, new, low-cost or free activities. I've spent weeks digesting this book and I feel like I should be keeping a list of all the things I want to do with River, except I've picked just about every activity in the book so I might as well go straight from the book! There are some activities that are young for River, good for 2-3 year olds, and and some that would be great for Kindergarten/First Grade aged kids. On page 84 is a list labeled "Top Ten Baggie On-the-Go Ideas. I immediately did number 1, filling a baggie with shaving cream and food coloring and sealing it with tape. We used blue and yellow food coloring (it's what we have). As River manipulated the bag, squishing it this way and that, the shaving cream took on more and more yellow and blue color, eventually blending to green. He played with this until I took it for a turn. Squishing that bag was one of the most soothing activities ... great stress relief. I found some activities I've done in the past and forgotten, like making our own balance beam, which I did when the older kids were preschoolers and taking gymnastics. One rainy day this summer I opened the book to a random page and found a project. It's hard to not find a project on every page. And most of the projects can be done with everyday on-hand objects, or by spending less than $5. Perhaps it's not yet obvious? I love this book. I enjoy almost all of the items I get to review, but I especially feel like I struck gold with this one. I highly recommend it for preschoolers - for your home school, for after-school or free play activities, for Grandma and Grandpa to have at their house. The Homegrown Preschooler, Teaching your Kids in the Places They Live, is available at Gryphon House for $29.95. If you use this book please share your thoughts on it with me. I'd love to know what projects you and your preschooler do. Thank you for your kind review! I'm thrilled that you liked the book. Would you mind posting one on Amazon? I'm so trying to put this book out there in a place where moms with kids that are preschool age will give homeschooling a whirl!